Kds' bedrooms are a terrific place for playing around with color. 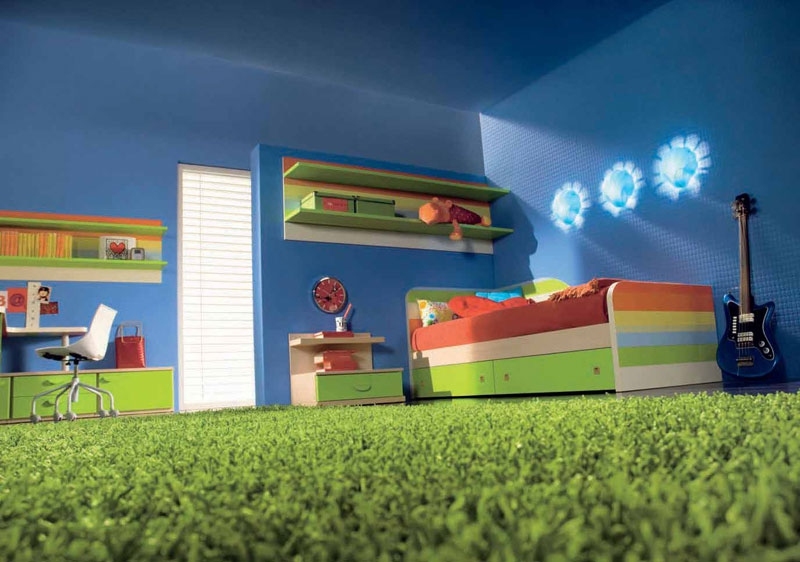 Children love to have bright, bold and uniquely colored rooms. It reflects the liveliness of their nature. Going too bold with a kids' room can be a mistake, though. You want to play around with a combination of bold colors and subtler accents to create a room where your child can feel awake and alive but still get relaxed enough to sleep at night! And you don't want to discount the power of neutrals, whites and blacks when decorating a child's room because these can add a different dimension to what you would typically expect to find when walking into a child's bedroom. In the end, of course, the key is to find the right colors for your own kid. Let your children's personalities come through as they help you to pick out paints and create the space that they live in. Pink is one of the most common colors that people think of when they think of designing a girls' room. Although it can be cliche, it can also be a really great color to have as a room when you're a young girl. This room here shows how bright pops of color on a fairly neutral floor can tone down the boldness of the pink walls. This creates a space that a girl can feel pretty in without making her feel too much like a princess. Red is a color that has the potential to be either all wrong or all right in a kids' room. If the red is too bright, the room can be overwhelming and even a little bit scary for the child. But a darker red offset with printed fabrics like we see here can be a rich, warm and welcoming color. Make sure to have lots of toys and fun things in a darker room like this to keep the mood of your child's room light. Softer colors are best when it comes to rooms where babies are going to be sleeping. Here is an example of soft coloring for a room that is great for people who don't want to go with pastels. The shades of paint and furniture here are light and pleasant and soothing. Orange is a really great color for kids who are starting to get older but who aren't quite teens yet. It's a fun color and a color that works equally well for girls and boys. Here we see black and grey decor that keeps the orange from being too bold. Another option would be blue accenting. Yellow is a terrific color for kids' rooms whether you've got boys or girls. It's a color that comes in many hues so you can have soft rooms or bold rooms depending on your child's personality. Here the bold yellow is toned done a bit with the blues and more neutral colors of the rest of the space. Choosing a few different colors that compliment each other and laying them out block-style in a room can be a great design option for a child's bedroom. Here the cabinets, desk and storage have different blocks of color. The rug also serves as a block of bold hue in the room. The colors are bright enough to be lively but not so bold as to be overwhelming. Another way to achieve the same effect with multiple colors is to put big blocks of color throughout the room. Here we've got a block of orange in the storage, a block of green in the shelving and a block of color made up by the bed. What's great here is that the rest of the room is light so the color stands out and really creates a bouncy feeling for the room. Stripes of the same color family are a terrific way to add some pop and pizzazz to a child's room without making the room feel too crazy. In this case, stripes in different colors of blue on the beds create a great look for a boys' bedroom. What I don't like here is the bit of green we see in the rug and the drawers. I think a rug that carried through with the blue striped theme would have served this room better. Many parents think that white is a bad idea in a kid's room. It gets dirty easily and it's not very fun, right? Wrong. A bright white room accented with different colors can be great for kids if you do it correctly and just don't worry about the dirt! Another color parents shun is black. Nobody wants their kid living in a dark, morose room. However, a black wall can actually serve well as the backdrop for bold artwork and other colorful pieces - like the planets we see here. One of the things that you can do with color in a kids' room is use it to write things on the walls. This is a great example of a saying that can stay on your child's wall for many years, adding inspiration to his or her life while providing a pop of color to the ordinary paint on the walls.